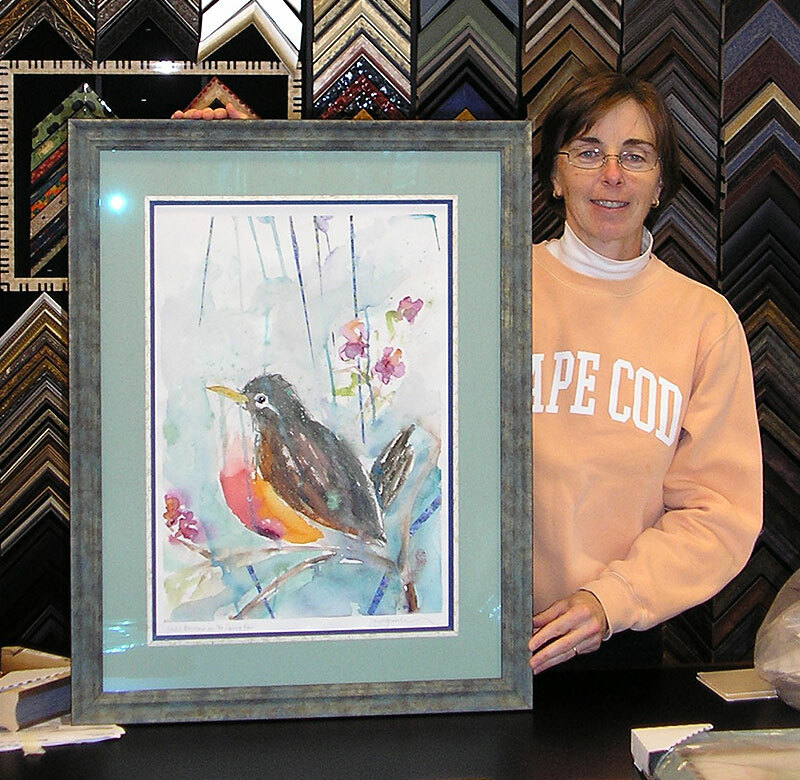 Welcome to our page of customer testimonials regarding the artwork we have framed for them over the years. 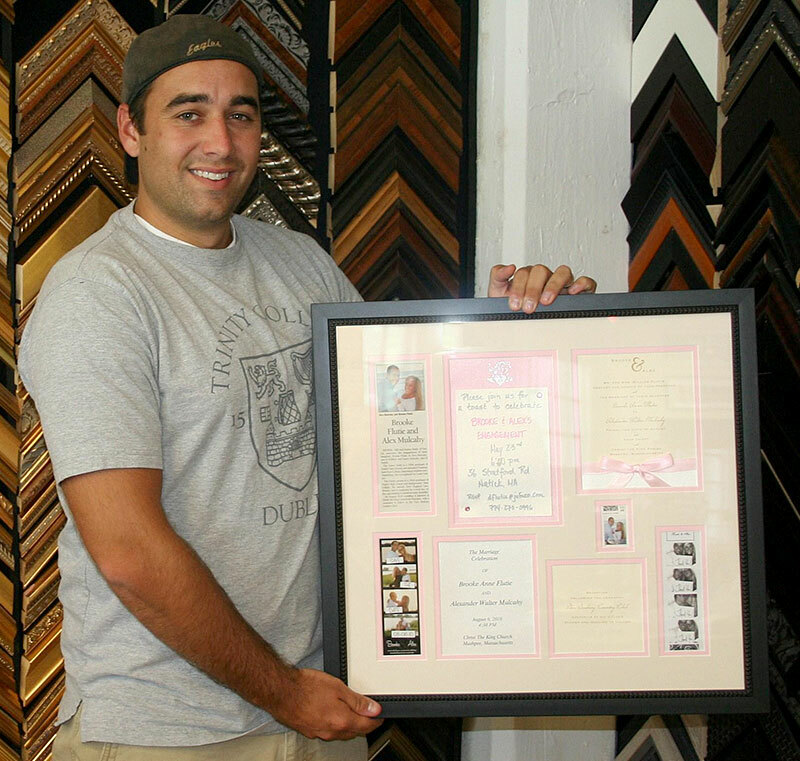 We are proud to say that we have actually received dozens of notes, emails and comments from our happy clients concerning not just our successful framing of their treasures, but our super friendly staff, our attention to detail, and our fast turn-around service. We invite you to stop in and see us and create an experience of your own! “Recently, we had an event that needed 15 sports jerseys​, and four photographs framed in a matter of three days on the week of Thanksgiving. John from Framed in Time not only got us all ​of our items in time for the event​,​ but they looked ​absolutely amazing​! ​You can tell each piece was well thought out with the best attention to detail I’ve ever seen. 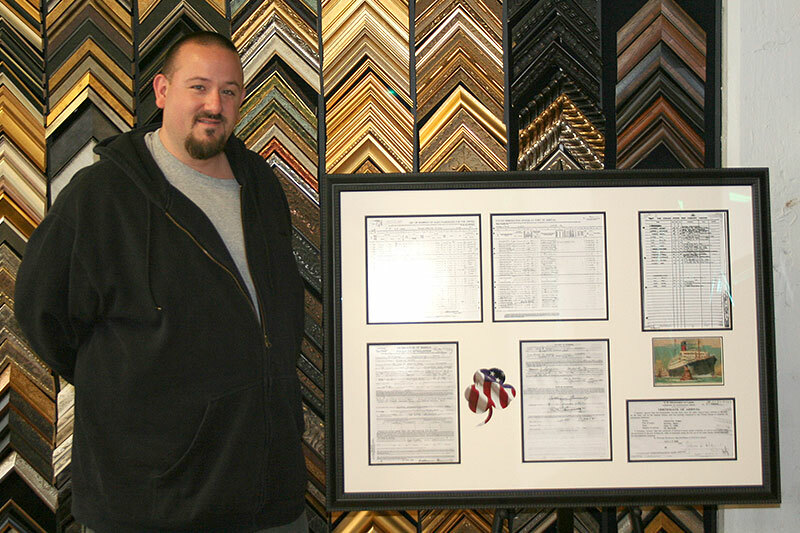 For example, we had a golf scorecard that was a part of ​our auction that needed framing ​and John took the time to frame it ​with turf to give the piece​ an extra edge and ​incredible detail. Even ​with a seemingly impossible task given to them, Framed in Time gave us an overwhelmingly positive experience with extraordinary results”. 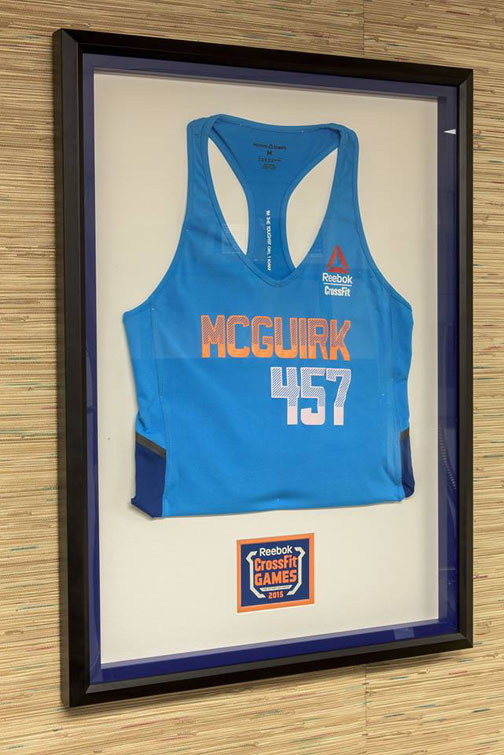 Had the honor of framing the jersey of a 2015 Reebok Crossfit Games finalist…Congrats! Good Morning, A few weeks ago I bought an “I Love You to the Moon and Back” plaque. When I came in to have a wire put on the back for hanging, the gentleman was so kind, professional, and his kindness left an eternal imprint on my heart. 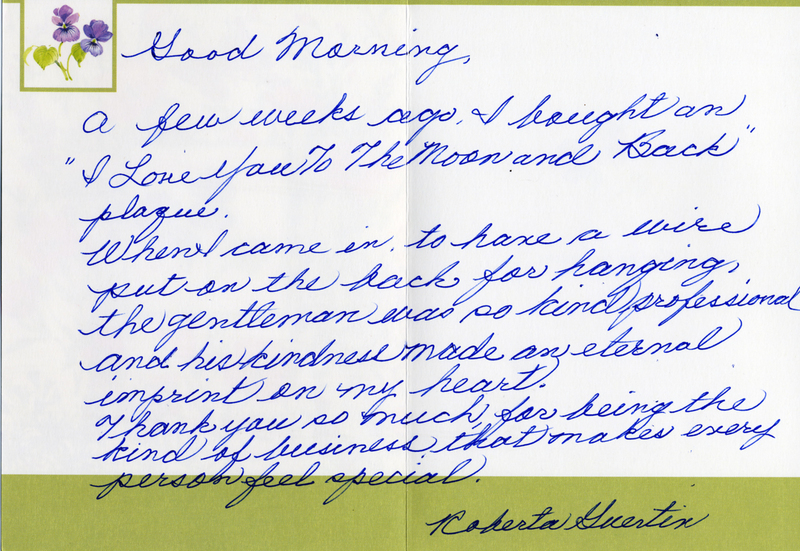 Thank you for being the kind of business that makes every person feel special. A wedding present for my son daughter-in-law. ‘Three Friends’ in Chinese Art, Evergreen, Bamboo, plum Blossoms represent endurance, flexibility and ability to withstand hardship: my wishes for them for their marriage. 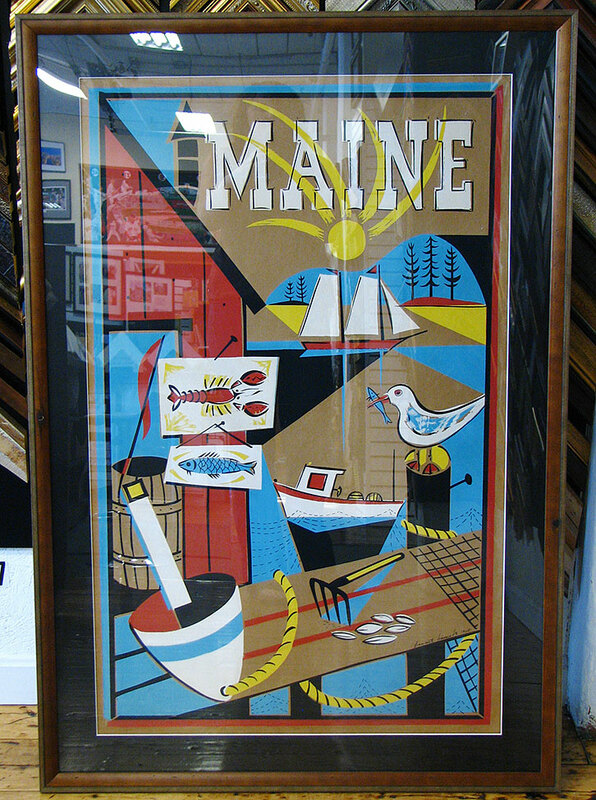 Framed In Time: excellent workmanship, quality materials and superb service. My Great Great Grandfather pounded silver as a hobby. 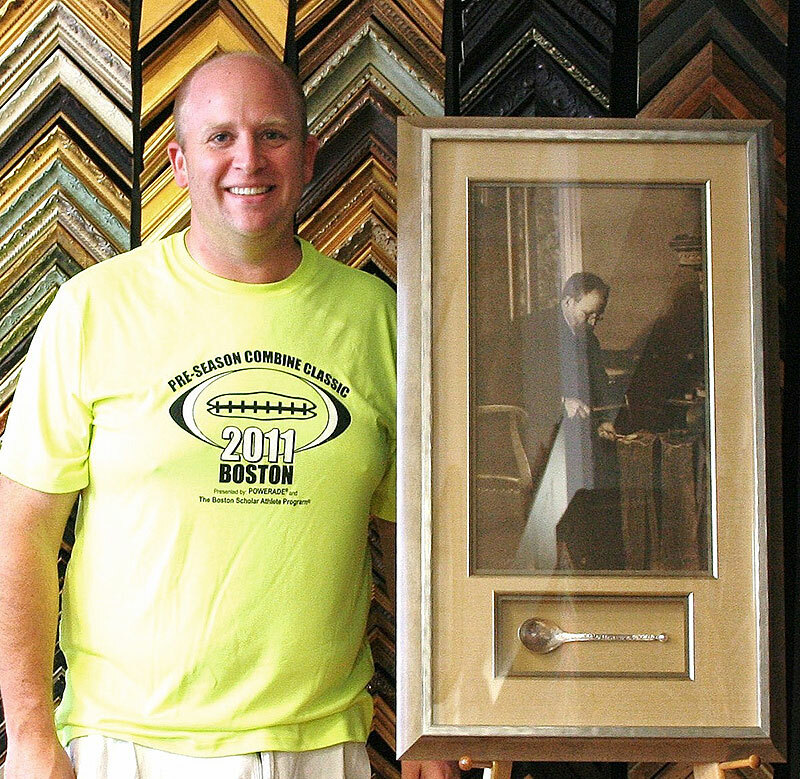 This is the spoon he was making in 1907. This is my only link to him. I wanted something my children would enjoy and did him justice. This is amazing. F.I.T. NAILED it! They are the best! 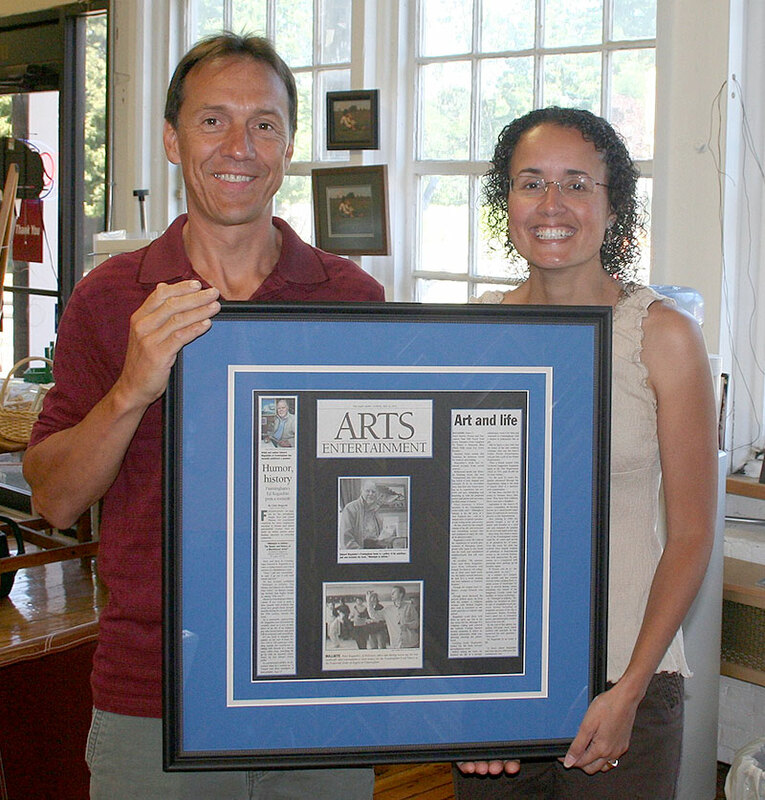 The Ron Burton Training Village has been working with Framed In Time for a very long time. 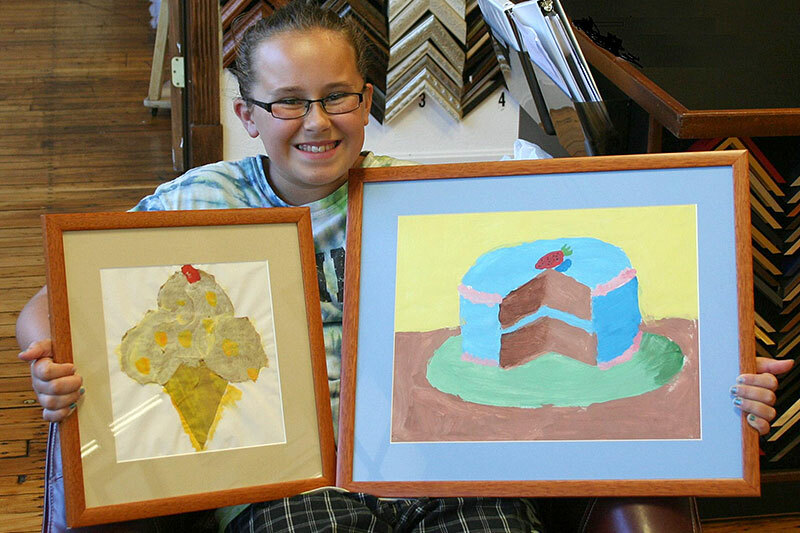 Through our partnership we have more than 150 framed pictures up in our camp Yawkey Dormitory. John Fournier and his incredible staff always deliver the best product with incredible quality and care. John’s generosity has been a tremendous blessing to our program for almost a decade. We have dozens of pictures of campers and their success stories on our walls at RBTV. 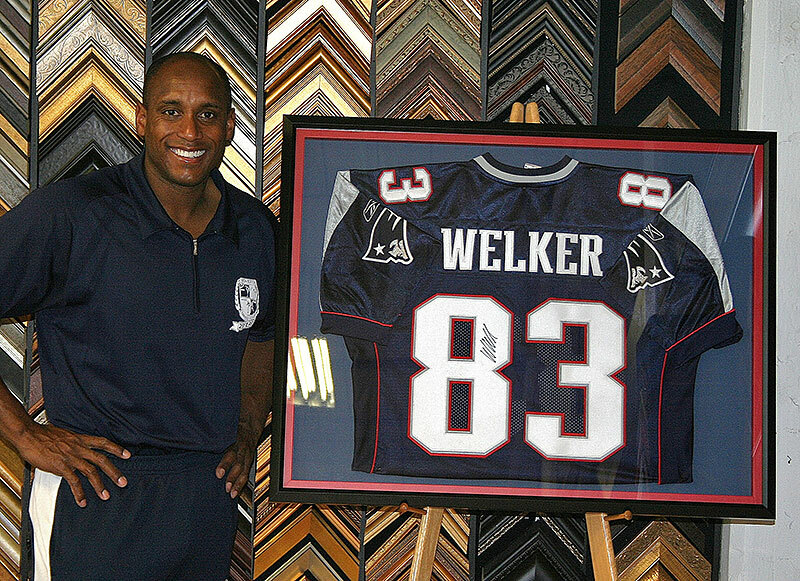 Framed In Time also frames all of our Patriots memorabilia for all of the silent auctions we have to raise funds for RBTV. RBTV is proud to partner with Framed In Time. We would not be where we are today without their generosity, sponsorship and service. RBTV Thanks Framed in Time for all of its support. I showed this artwork to my friend Norma and she said it was a beautiful sample of the German art of paper cutting called Scherenschnitte and that it is priceless. Framed In Time is very helpful. This represents my daughter’s passion and persistence. It took ten years to write what it took for her to succeed. 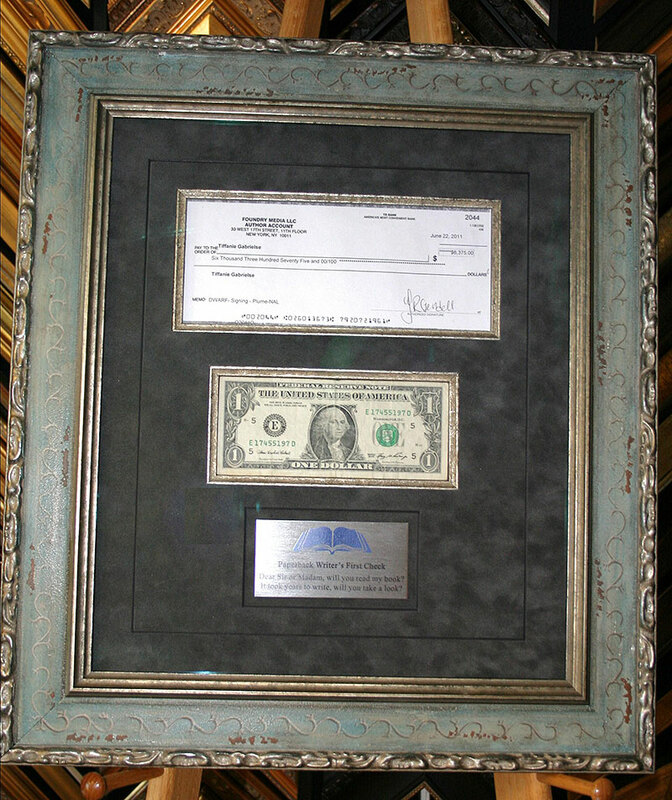 Her first check, her first dollar from her first novel, a memoir of her fight to adapt to her challenges. Framed in Time was professional, helpful and creative. I was indecisive; they were patient and very excited to create this masterpiece. Thank You! First wedding anniversary gift for my wife. Dad’s turning 80 and we are lucky to have him because his health is not well. This article portrays his life story, that we can all remember him by. When I bought this watercolor, I wasn’t sure if I had done the right thing or wasted my money. I was almost embarrassed when I brought it in because it seemed so ugly. 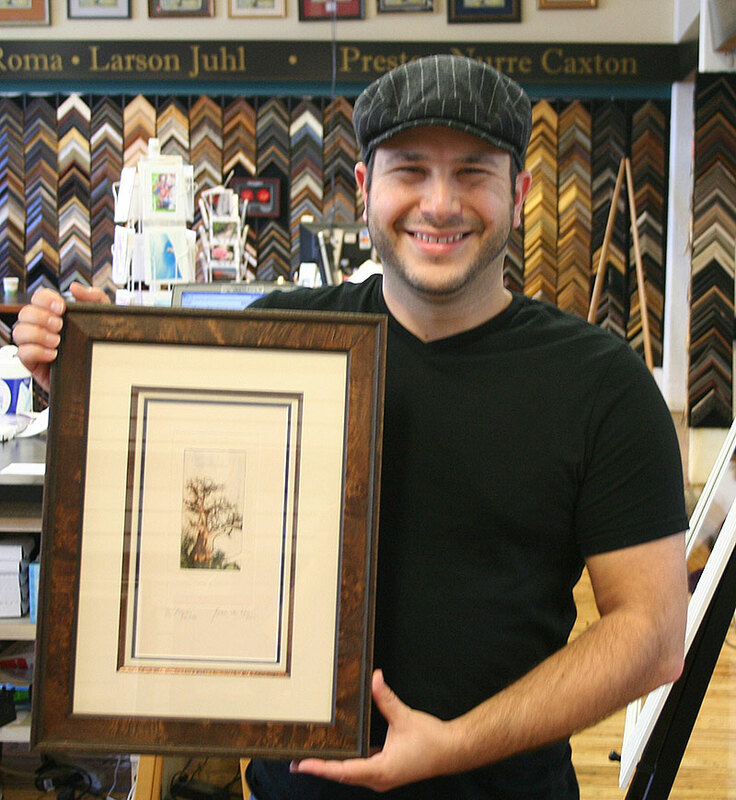 The staff at Framed In Time sat with me and found the perfect mats and frame. I was stunned when I saw it. It was beautiful, better than I could have hoped for. 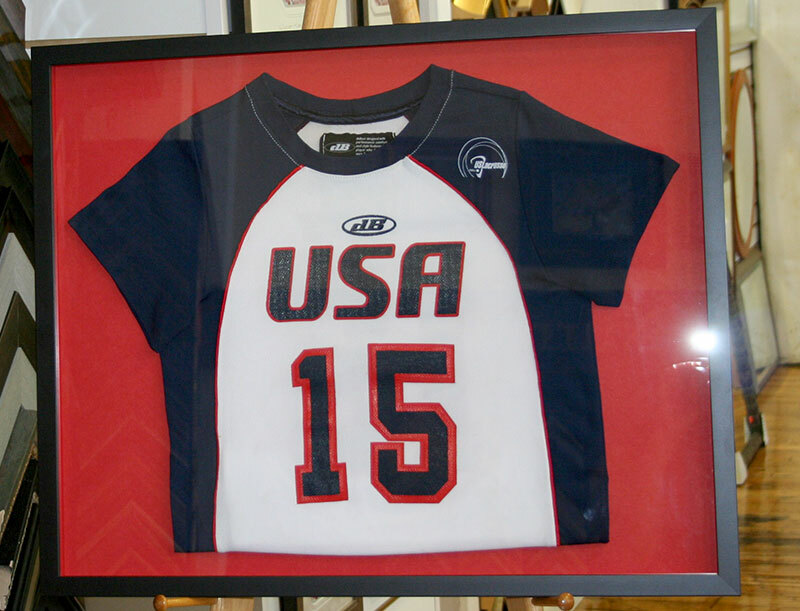 Daughter Kristin’s U.S. Women’s Development Team Lacrosse shirt from 2007 which she wanted to display. 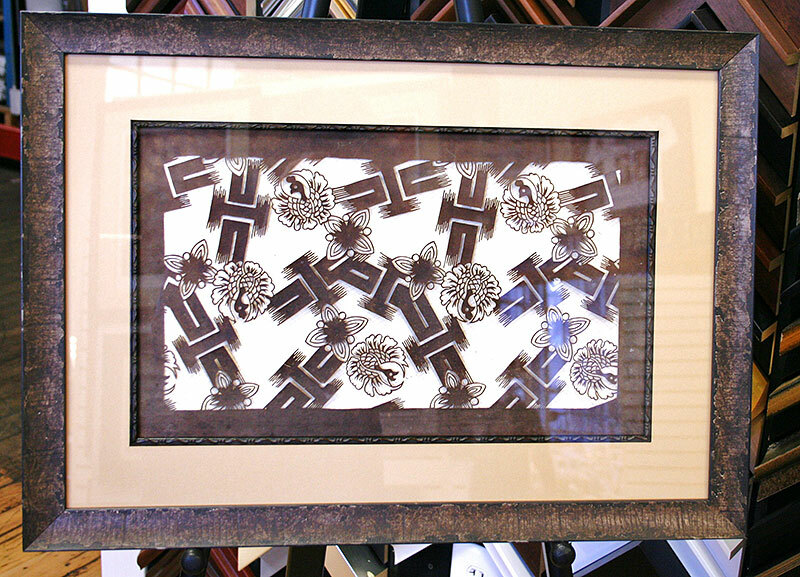 Framed In Time did a great job, great consultative approach, very talented sales staff, and quality work. I have had this for a long time and wanted it better preserved and protected. I had a great Aunt who was in missionary service in the 1920s to the Navajo Reservation and it was too pretty to leave rolled up in a drawer. I had the UV glass to protect from fading, especially the red color. 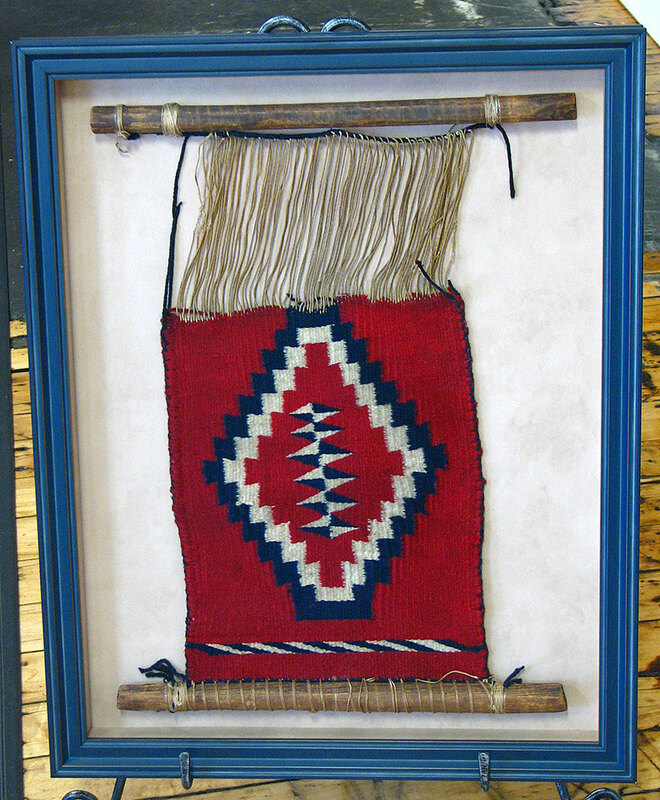 I believe it is called a Germantown sampler, but it shows Navajo weaving technique nicely. 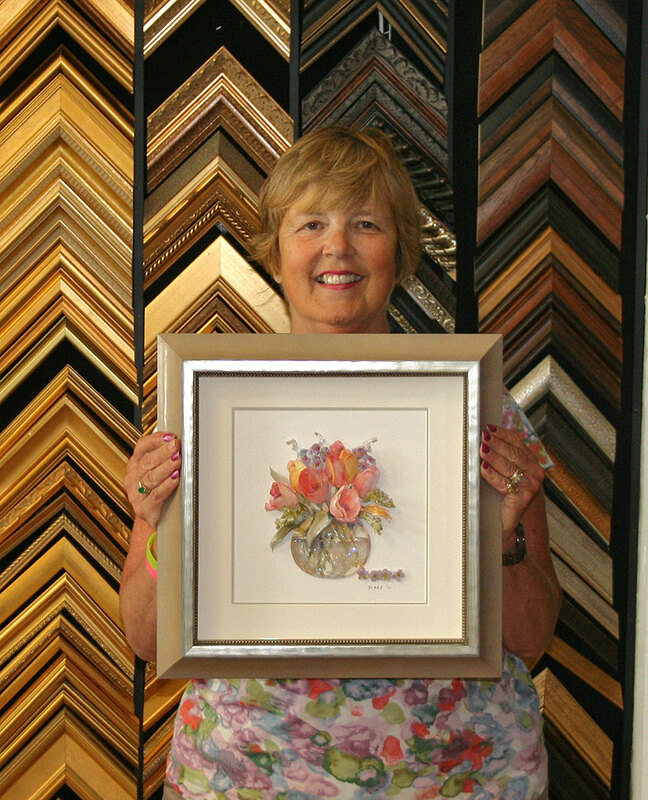 I bring all my stuff to Framed In Time for their expertise and advice and no house should have blank walls. 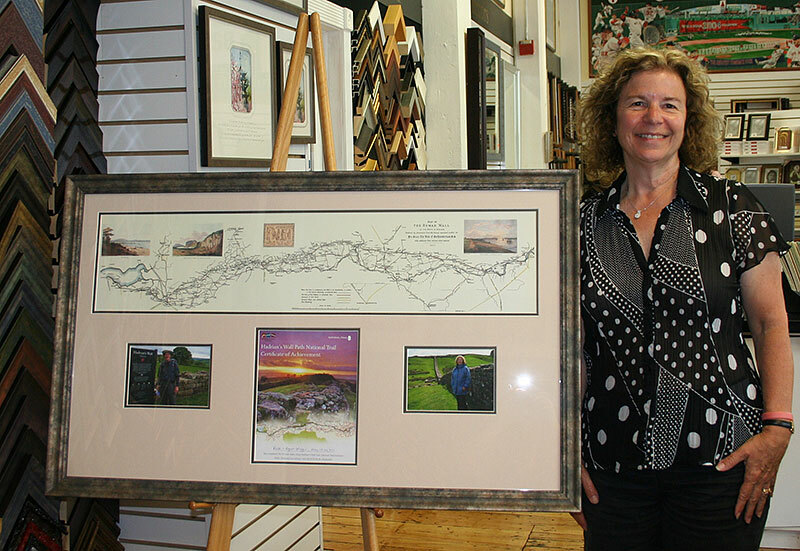 My husband likes challenges and suggested that we do the 84 mile hike along Hadrian’s Wall in Northern England. The guidebooks suggested hiking east to west, which we did. All of the British people were hiking west to east, because the winds come from the west! We hiked in a lot of rain with strong winds coming at us! To hang in my son’s room as a gift for good grades. 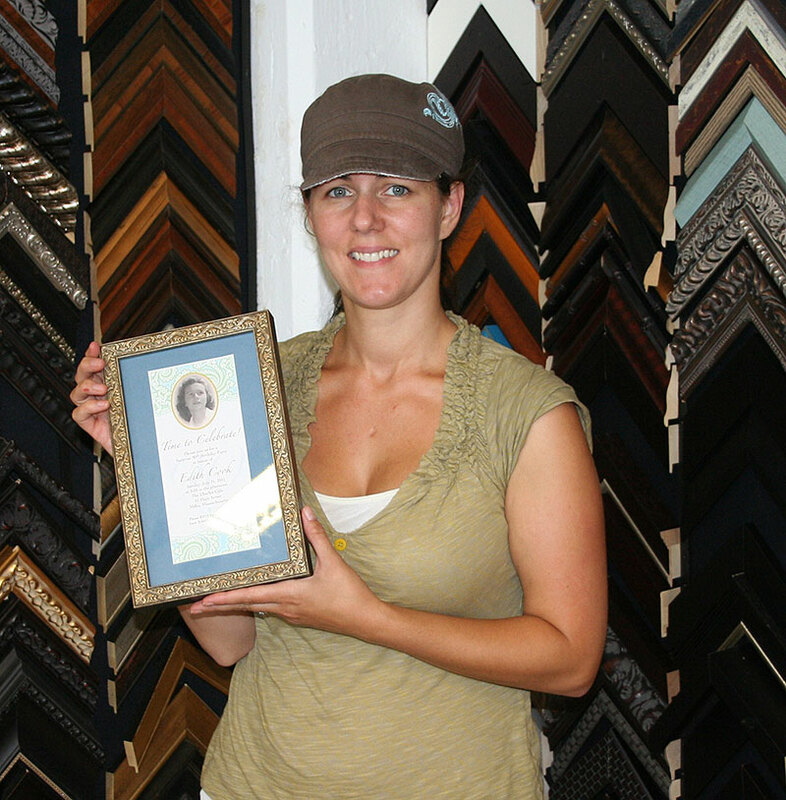 Framed in Time are always friendly, helpful and talented. I want to give this to my granddaughter. 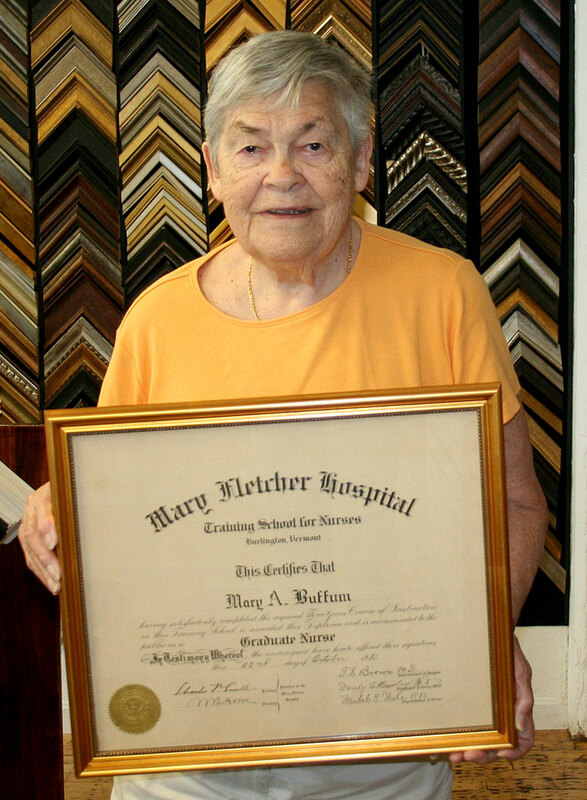 It is her great grandmother’s diploma from nursing school. I am also a registered nurse and she is following in our footsteps. Framed In Time does a beautiful job. This was in my parents’ home since the 1950s; it was in our kitchen and the first thing you saw when you came in. My mom wanted to have a picture/painting of Maine. She heard about a man in Blue Hill. She went and asked him for a silkscreen that spoke of Maine. My Grandmother turned 90 and this piece was a brilliant way to capture her milestone and remember her journey thus far. It truly is a beautiful piece and was a special day to celebrate! 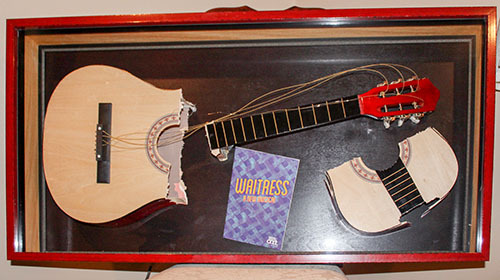 The cake was a school art project which was displayed at the library. It’s the perfect unique piece for our dining room. The ice cream cone fits in with the dessert theme, and dresses up the room. 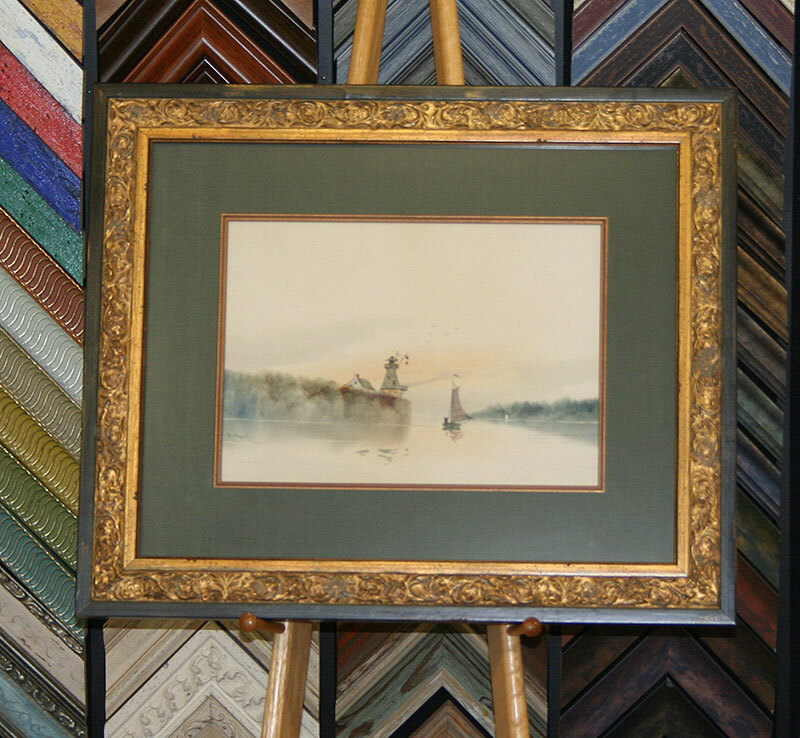 Framed In Time was very helpful in choosing mat colors and making some special pieces beautifully framed. 3-D Art of a bowl of tulips was done as a gift for my parents. Framed In time always does an outstanding job. My Dad and I had been building a yurt in Maine for a family getaway space for the better part of 10 years. As cozy and intimate as the wood lattice work is, it needed some ambiance. After digging on the web, found a great 30s era poster and it needed some protection. Awesome Frame, this is going to look fantastic! In particular, they’re aware of my unique needs for the environment. Hadn’t even thought about materials but they knew their stuff! I framed this for a friend who has always been here for me and wanted to do something special for him for Christmas. 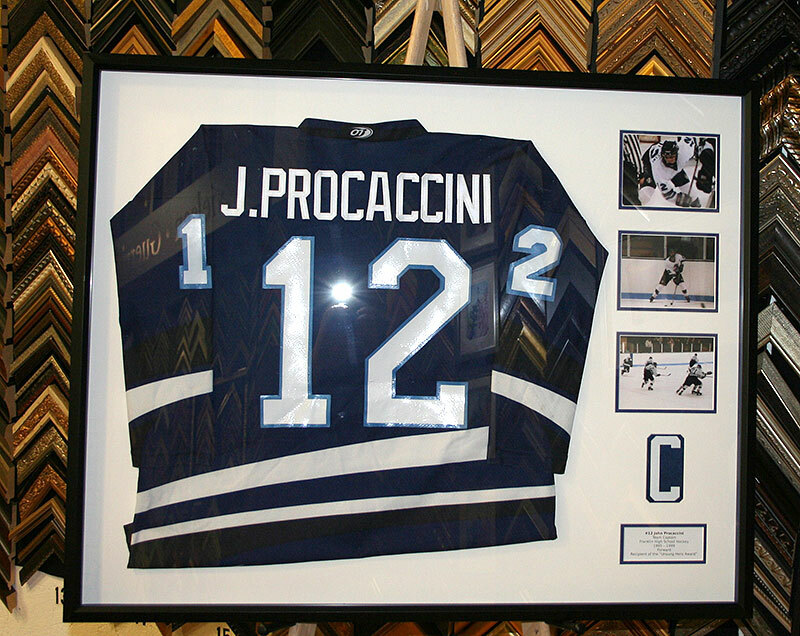 I was able to get a hold of his High School hockey jersey from 1999, have his name stitched on the back and framed w/ pictures of him playing. With help from his sister, parents, former coach, hockey booster and many others, and of course Framed in Time, I was able to give him this. 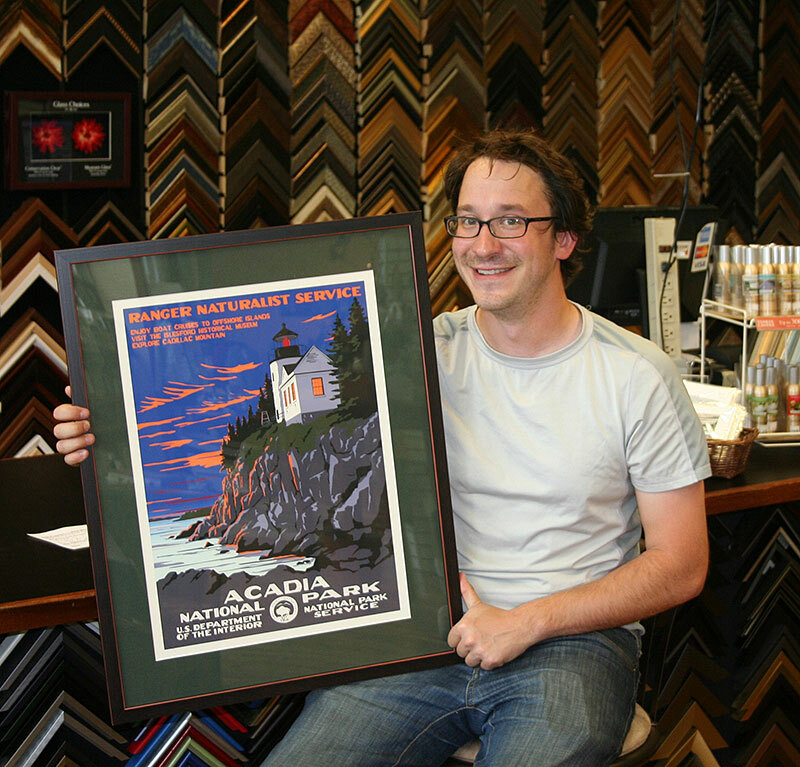 The folks at Framed In Time are extremely friendly and professional. They work very quickly and produce a very high quality of product. My favorite art medium is watercolor and the subject attracted me because it made me think of Holland, where I had lived as a child. 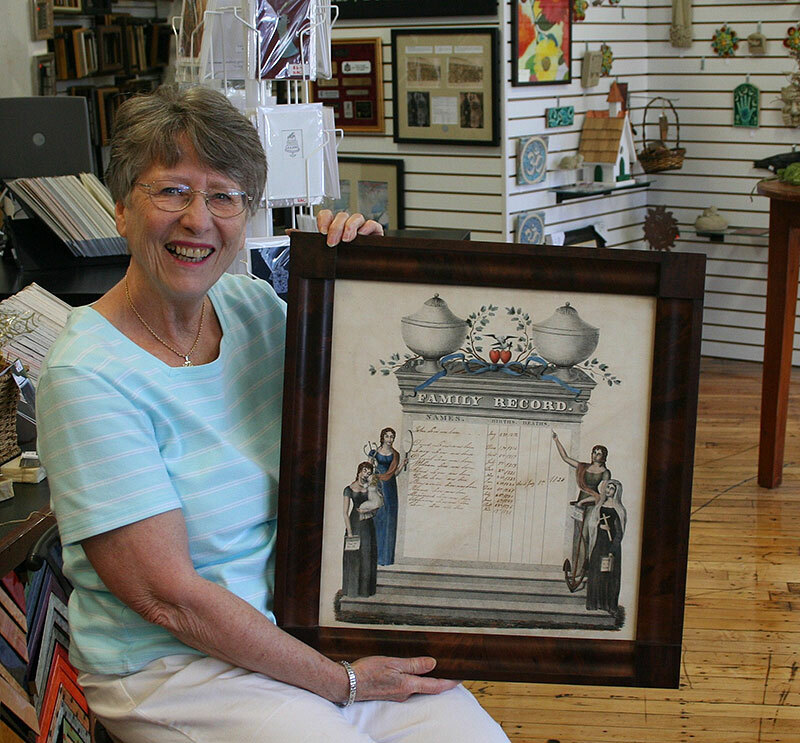 I bought it at a consignment shop and wanted an older, more elegant frame. I also wanted it formal for my living room. I came in with a very specific idea and the staff listened and spent as much time as I need to find what I wanted. The final product is perfect! 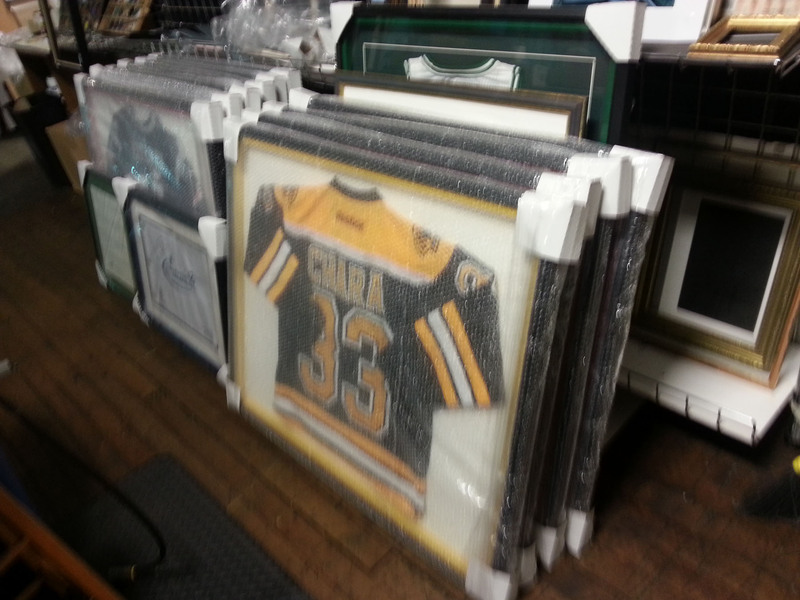 Purchased and framed for my new game room, will look great with my pool and poker tables. Framed In Time offers fast service, looks great and a friendly dog, what else could you ask for! This document is a family record of the births of my great grandfather and his sibling in the early 1800’s. 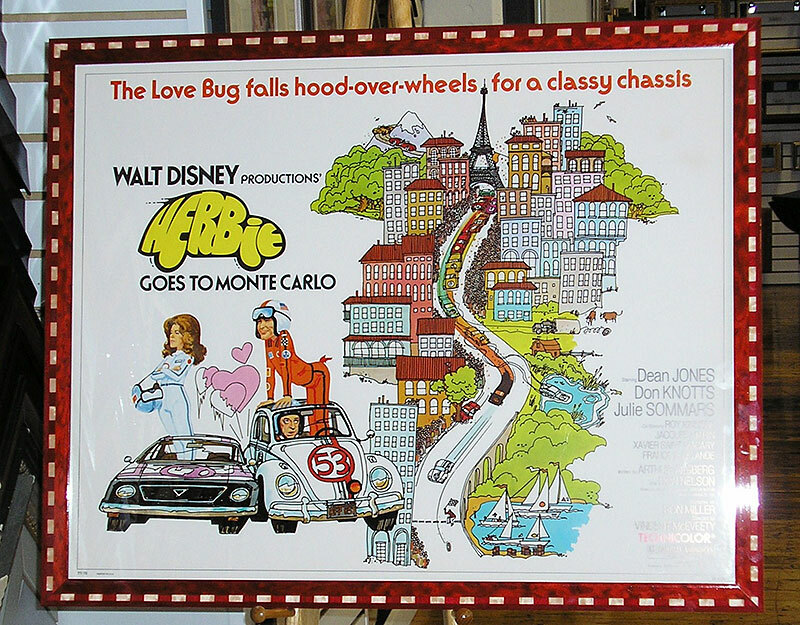 The frame is original and so beautifully restored. My maternal Grandmother was born in Clonakilty, Ireland in 1911 and we knew she immigrated to America when she was young but never had any other details other than that. She was a very special person to my entire family and even though in January it will be 13 years since she passed away, the loss is still very much felt. Recently a coworker became an American citizen and it reminded me of how proud my Grandmother was to be American. I started doing some research online and found that all of her records were available to view through the National Archives. After visiting the Boston branch, I had copies and JPEG files of her Petition for Naturalization and Certificate of Arrival along with the pages from the ships log book and the Port of Boston log book. My cousin went to the National Archives in Dublin, Ireland and sent me a copy of the 1911 census showing her as being six weeks old. 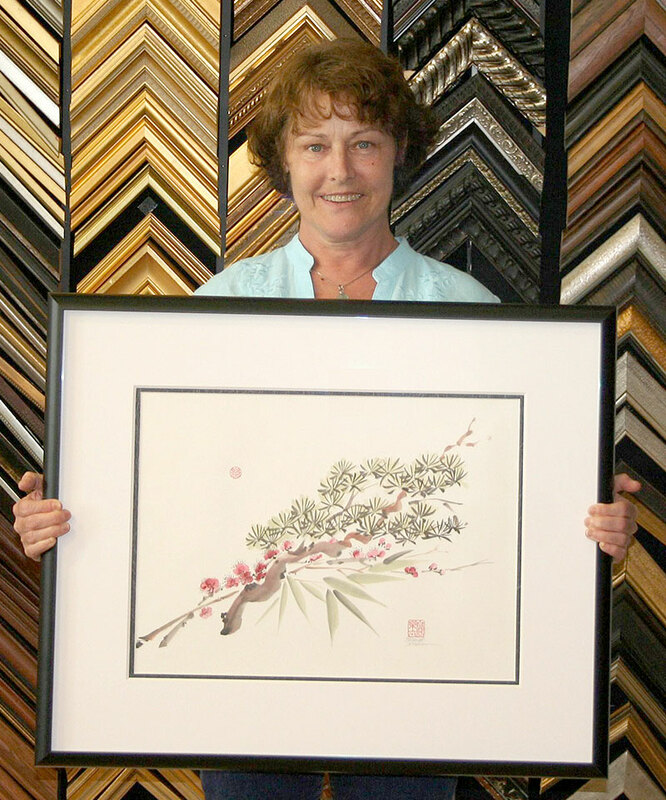 After I had the files printed on high quality giclee paper, I visited Framed In Time for a consult. I worked with John and we decided to do two separate pieces, one with the Irish census and pictures of the land where my Grandmothers’ house once stood and one with all of her American documents ( plus an American flag and a postcard of the ship she came to America on). Working with John and the entire Framed In Time crew was an absolute pleasure. They made great suggestions for the layouts and helped me pick out a frame and matting that would fit the piece. This is by far the best Christmas present I’ve ever given my parents. My partner and I just returned from a ‘trip of a lifetime’ to South Africa. We found this etching in a gallery and were amazed by the artist’s work. 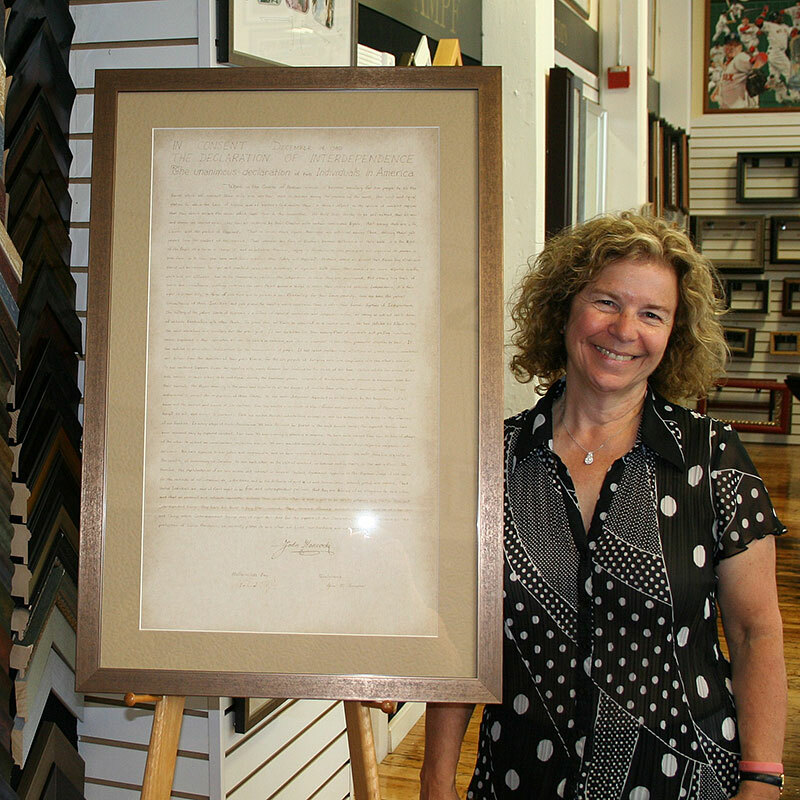 We couldn’t get to Framed In Time fast enough to have them help turn this special piece into a true work of art! 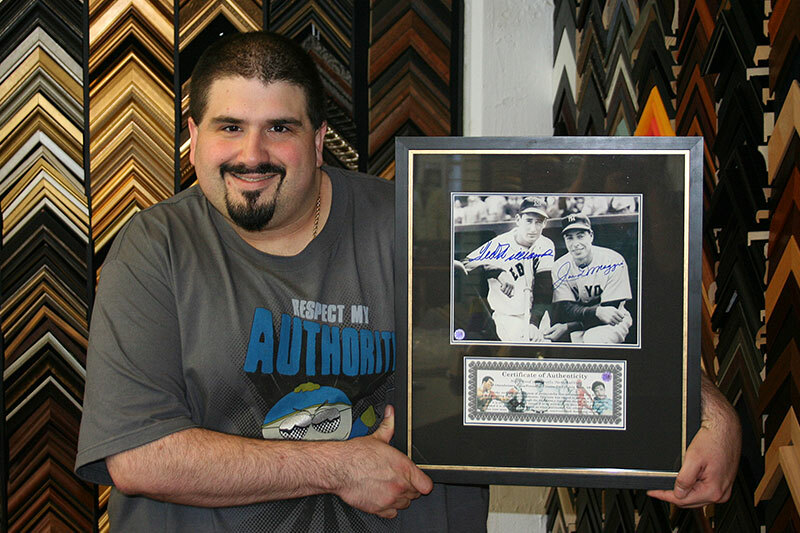 I have been coming to Framed In Time for over seven years and always come back because of the quality and amazing service. My husband loves early American history and decided to rewrite the Declaration of Independence to be the Declaration of Interdependence and made it personal to us. He surprised me with this and it was his way of proposing! We signed from Massachusetts Bay (my husband) and Pennsylvania (me). 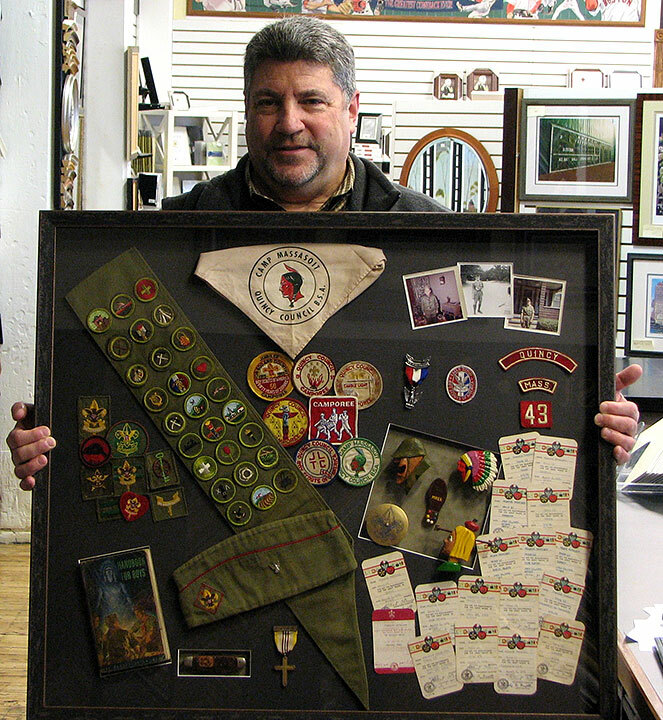 While cleaning up my cellar I came across a box full of my old scouting badges and other boy scout memorabilia. I thought it would be nice to frame everything and pass it along to my Grandchildren. Framed In Time exceeded my expectations. It looks so good I may keep it for a while!